Eco Tours USA & Air Boat USA We are the premier Airboat Everglades National Park Adventure Company! Only 30-45 minutes north of Key Largo! 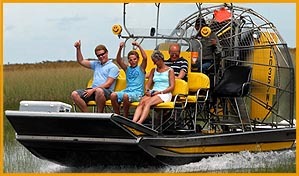 Ride the Wilde Side with EcoToursUSA and AirBoatUSA! 1 Hr. of Swamp & Gator "Wildlife Adventure"
Copyright © 2014-2015 Supersoft USA.